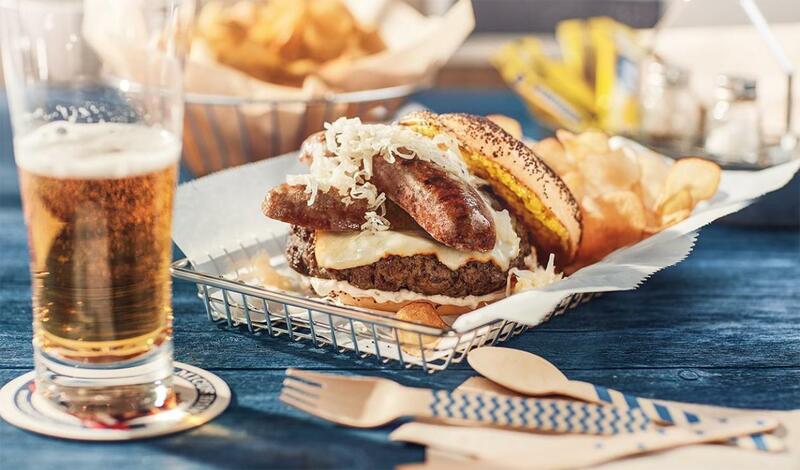 A pork and beef patty blend topped with beer bratwurst, Muenster cheese, sauerkraut, beer mustard and beer mayonnaise. Add beer and cook until evaporated. Combine in a blender with Hellmann’s® Real Mayonnaise and puree until smooth. Mix ground pork and beef and form into 4 oz. patties. Cook the patties through and grill bratwurst. Spread top bun with Beer Mustard and bottom bun with Beer Mayo. Split the bratwurst lengthwise. Top each burger with 2 bratwurst halves and sauerkraut.